I don't know about you guys, but I needed a detox. So much deep-fried turkey, too many scoops of leftovers sides and a slice more of pie than was needed. Ugh... and before you know it Christmas parties, treats and flowing wine will take over my life. My life is hard. But in all seriousness, after returning from a morning of travel the Husband and I were both craving something both light and comforting tonight. This white bean soup packs plenty of dark, leafy spinach and a refreshing change of protein pace from all that turkey. A bit of bacon keeps it real. 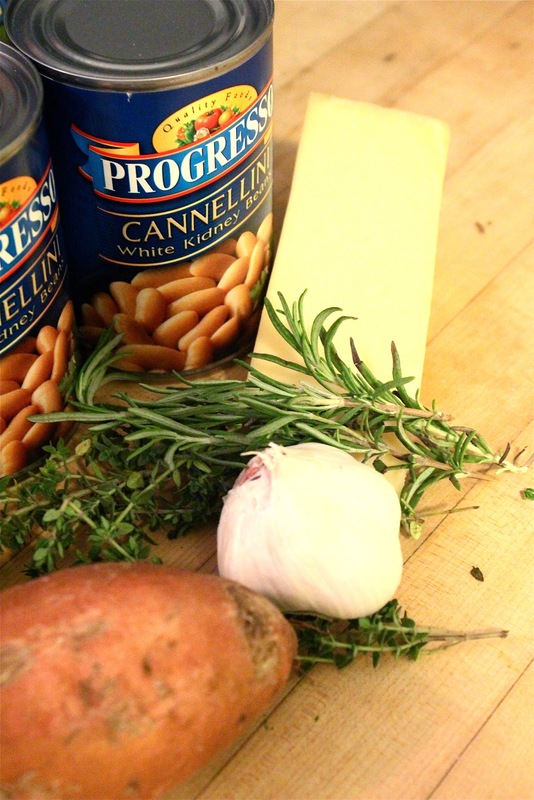 I love keeping canned beans around the house, especially in winter. They can help you easily turn soups or vegetable dishes into a more filling main attraction. Good-quality parmesan gives this lots of flavor too. Crisp up the bacon and keep the gorgeous fat in the pan. That's what you'll use to saute your veggies, infusing them with oodles of flavor. Bacon gets a bad wrap, but the kind I buy is only about 100 calories for two slices... that's a LOT of flavor for a relatively small caloric investment. 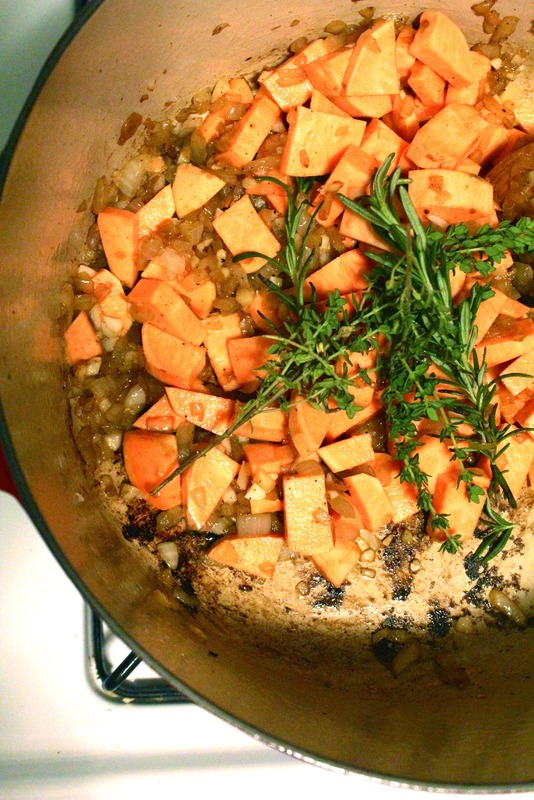 Soften up the onions before adding garlic, sweet potatoes, rosemary and thyme. 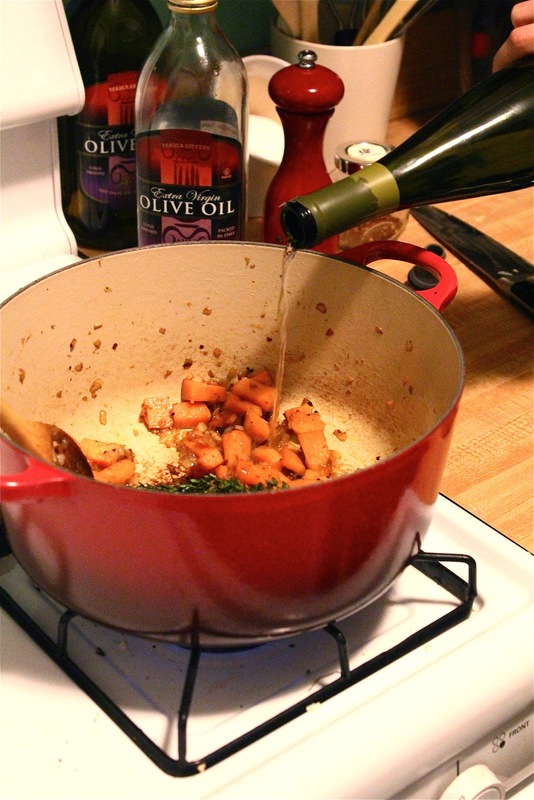 Once the sweet potatoes have started to soften, in with the white wine. Be sure to scrape up all the delicious bits from the bottom of the pan. That's the whole reason you add the wine... to deglaze (e.g., un-glue) the brown bits from the pan. After the soup has simmered and you're ready to serve, in with a fresh load of spinach; stirring until wilted and incorporated. Top with your reserved bacon and a bit of fresh grated parmesan. Mentally prepare yourself for the impending holiday madness. You're gonna make it. In a heavy bottom pot, heat olive oil over medium heat and add bacon; cooking until crispy. 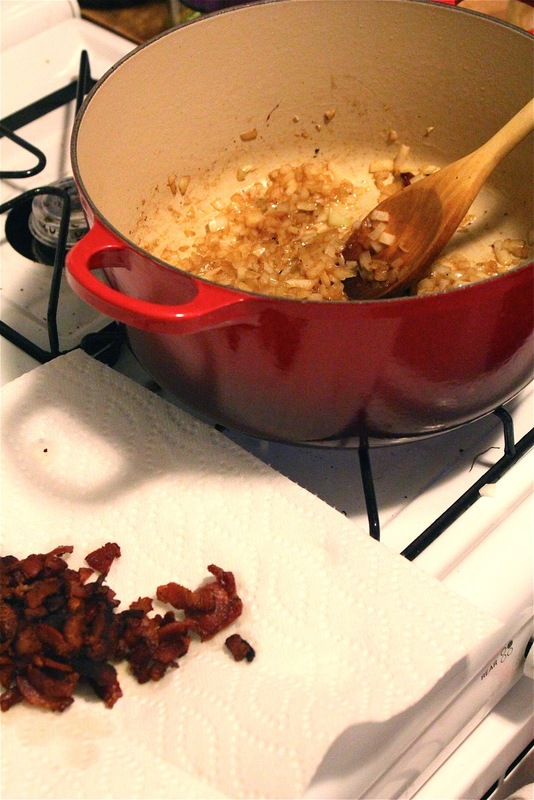 Remove bacon from pan and drain on a paper towel lined plate; reserving for finished soup. Add onions to remaining fat in pan, cooking until softened, about 5 minutes. Add garlic, sweet potato, red pepper flake, S&P and herbs to pan. Cook sweet potatoes until slightly softened, about 8-10 minutes. Turn up heat to high and add white wine; scraping the bottom of the pan while stirring. Cook for 3 minutes before adding beans, parmesan rind and vegetable stock. Bring liquids to a boil and reduce heat to low. Simmer, covered, for 30-45 minutes or until sweet potatoes are cooked through. Just before serving, stir in spinach to wilt. 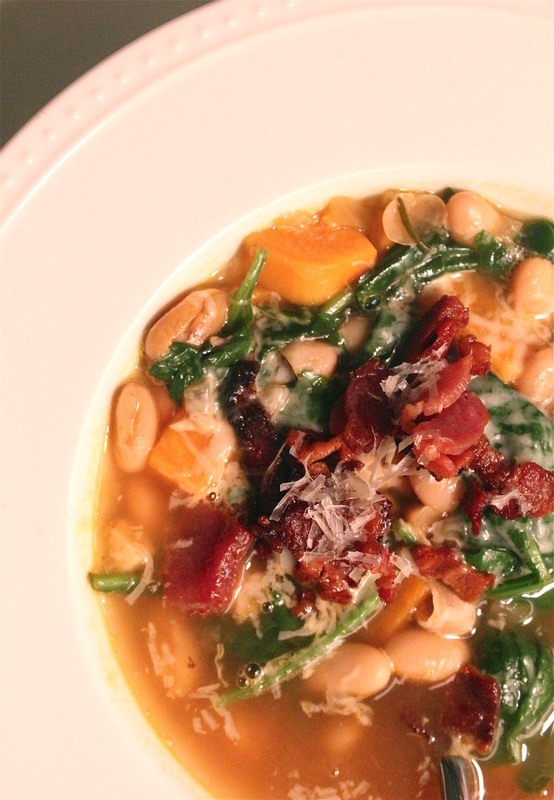 Serve soup hot with a sprinkle of parmesan and reserved bacon.